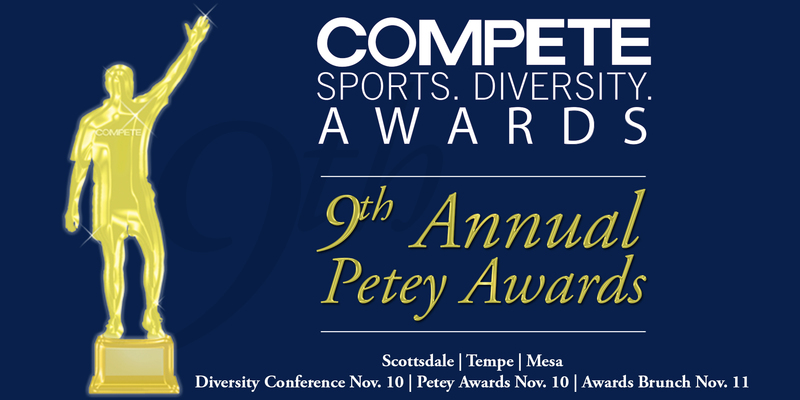 PHOENIX, AZ – October 24, 2018 — Compete Magazine and the Sports Diversity Leadership Council will honor the Arizona Diamondbacks, Arizona Coyotes, Arizona Cardinals, NFL and former NFL player Ryan O’Callaghan among others at the 2018 Compete Sports Diversity Awards, also known as the 9th Annual Petey Awards, in Phoenix, Arizona area on November 10th. The event will be co-hosted by Eric Carlyle, Compete CEO; Jake Mason, USA Dodgeball president; Angela Smith, ASANA Softball commissioner. “We are excited to be honoring these outstanding organizations and individuals who have made great inroads in sports diversity,” said Compete CEO, Eric Carlyle. The Arizona Diamondbacks are being honored for their “D-backs Pride Pack,” the Arizona Coyotes are recognized for their Rainbow Pride apparel and the NFL is being honored for its work in diversity, including women coaches. Ryan O’Callaghan, a former NFL player, came out last year has just launched a foundation that is inspiring many both inside and outside the LGBTQ+ sports community. Levar Stoney, the mayor of Richmond, Virginia will be in attendance to accept an award. The Sin City Classic, the largest LGBTQ+ annual sports tournament will present Las Vegas Convention & Visitors Authority an award. Other award winners include Sam Lehman, Patrick Gamble and Conard Franz. Additional award winners will be announced. Compete and the Sports Diversity Leadership Council (SDLC) will also host an important Conference sponsored by Experience Scottsdale from 9 a.m. to 1 p.m. on the day of the awards. The Diamondbacks, Coyotes and O’Callaghan will be panelists at the Conference and former Olympian and Pan American Silver Medalist, Gale Fitzgerald will host a women’s panel. There are a limited amount of tickets to the Sports Diversity Leadership Conference. Please contact [email protected] for Conference information. Compete Magazine was founded in 2006 as the world’s first and only gay sports magazine. Twelve years later we have evolved into the Voice of Sports Equality, Diversity and Inclusion. We reach over 80,000 readers with each issue of Compete Magazine and receive more than one million website hits each month. Sports Diversity Leadership Council (SDLC) was founded by Compete Magazine in 2014. The SDLC represents 80+ organizational members with over 110,000 participating members. SDLC members host more than 400+ events and tournaments nationwide each year. BE A PART OF THIS CELEBRATION OF DIVERSITY! 2018 World Gay Rodeo Finals® Welcomes YOU!